A great choice for local multiplayer with friends. No online component, coupled with no story mode, means it isn't much fun to play on your own. It’s a scene many of us remember fondly – a group of friends gathered around the tv for some frantic multiplayer action in the latest favorite game. For many of us, the option to play together is what really made those games (and parents have always liked that kids can play together rather than fighting for their turn). That scene has gotten less common in recent years, as the push to online multiplayer has made local multiplayer much less common. Of course, the best games include both, and a robust single player option as well, but sometimes you just have to settle for a game that’s good at only one. Paperbound is a game that brings the idea of crushing your friends in person back to the forefront. There isn’t any online mulitplayer option – you’ll have to beat them locally, but that does make the victory that much sweeter. Paperbound is an arena fighting game, and the fact that it is very easy to pick up and play makes it perfect for impromptu gaming nights, as even a novice can learn the moves quickly (although mastering them is another matter entirely). The controls are simple – and every character plays the same. There aren’t any complicated signature moves to master, or dozens of button configurations to figure out. While that complexity can be a great thing for in depth fighting games, Paperbound’s simplicity makes it a great party game (and not much else). Each character has three different attacks – melee, scissor throw, and ink bomb. You can use your melee attack with either the square button or R2, throw/aim your scissors with the right stick, and launch your ink bomb with L2. The ink bomb can take out several opponents at once, if perfectly timed, and the scissors is an instant fatality – you only have one, but you can collect others that are left stuck in walls by other opponents. Melee is fierce, but you’ll need to get close to be effective – and that’s tough, what with all the tiny figures zipping around the screen. 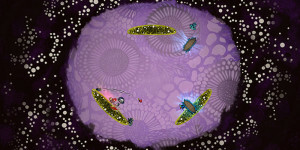 The entire arena is shown while you play, which is necessary due to the gravity mechanics of the game. 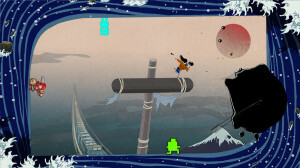 By pressing the triangle button, you invert gravity for your character. This means you can zip from the top of the screen to the bottom in an instant. 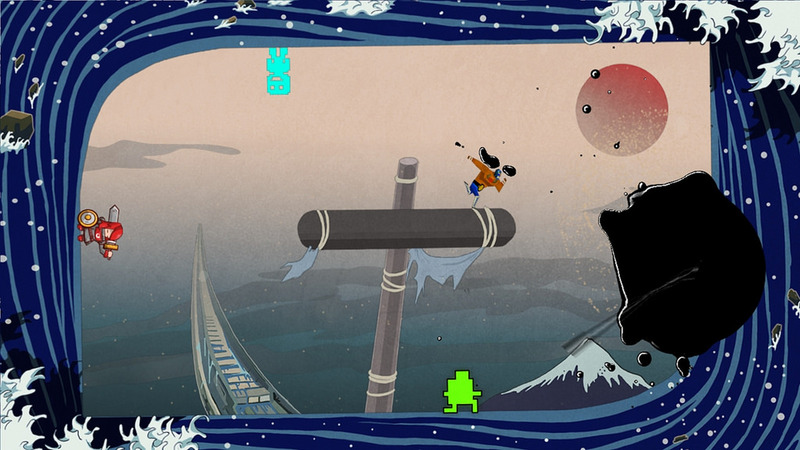 Your character is also sticky, meaning it can stick to walls, floating islands, or anything else on the screen. 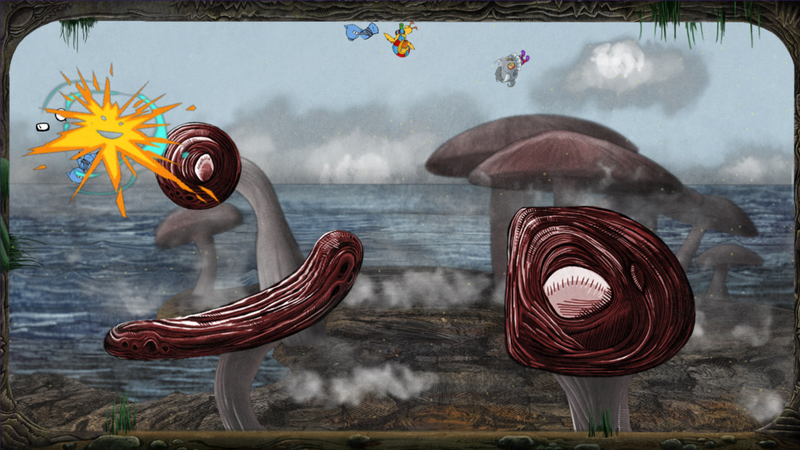 These mechanics make Paperbound fun and challenging, but the necessity of showing the entire arena at all times makes your characters rather hard to keep track of during frantic action -and that’s a shame, because there are tons of interesting characters, all done in a colorful hand drawn style. The arenas are also done in the same great style, all inspired by paper and pen. You choose arenas by flipping through the pages in books, and the paper references abound throughout the game, from the Capture the Quill mode to escaping the arena through a rip in the page. The characters look like they could have stepped out of your favorite comic book, and there is a nice variety to choose from, with everything from a skull soldier, to a monk, to Captain Viridian himself. You can take your characters of choice through a variety of game modes like classic versus and survival, and even a tag-like long live the king. All of this makes for great variety for your games with friends, and having a go-t0 game for get-togethers is great. However, the single player mode just doesn’t stack up as well. There isn’t any story mode to speak of, so single player is just you playing with bots, and it all seems pretty much the same after a short time. You’ll quickly find out that you play Paperbound for some great multiplayer with friends, and that’s it. 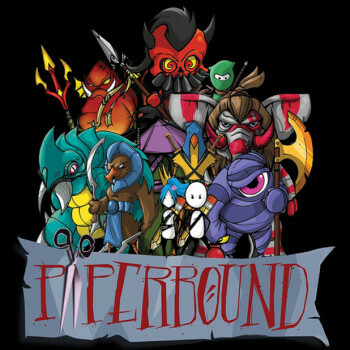 That being said, having a game you can play with friends of all gaming levels is a great thing, and Paperbound is a nice choice for some fun local multiplayer action.